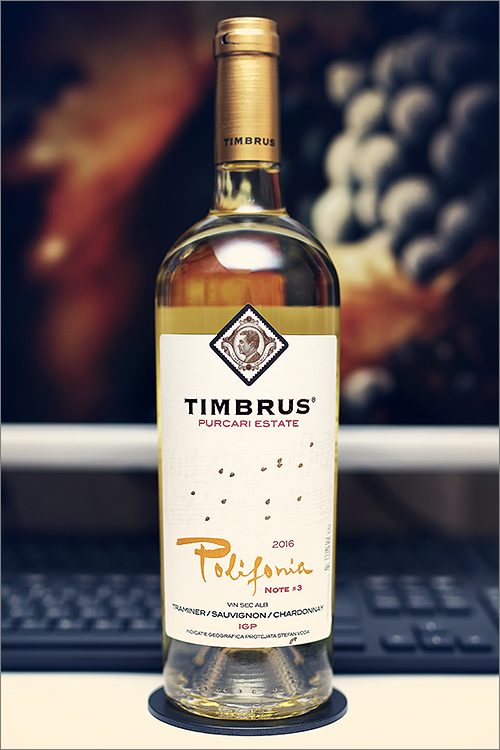 Tonight we are going to review a white wine blend from the protected geographical region of Stefan-Voda – Polifonia Note #3 2016 by Timbrus. The wine is a blend made of three grape varieties: gewurztraminer – the one responsible for the sweet notes of rose petals, sauvignon blanc – which brings on notes of hay and gooseberry and chardonnay – responsible for the main body and structure. This wine is part of the ‘Polifonia’ wine series, that was released on the market this past summer, a series made of three wines, each one with its own character and individuality. Timbrus vineyards are situated in the legendary Purcari region at the south-east of Moldova, a region that is famous for its unique terroir. But enough theory, without further ado, let’s get straight to the tasting! Pale straw-yellow color with yellow-white hues towards the rim of the glass. The nose is rich, filled mostly with sweet fruits and citrus flavours: lemon, pear, ripe gooseberry, yellow apple, quince, jasmine, straw grass, white apricot, acacia flower, elderflower, pineapple hay, wormwood, leek, moist oakwood, chalkstone, rose petals, yellow mirabelle and some subtle hints of mango. The wine is medium-dry, with high alcohol level, high acidity and rough tannin. This is a lean, zesty and quite a bit angular white blend, with a firm and citrusy profile. It tastes rough, green and austere, with a fair overall balance. The wine is quite refreshing yet bitter and sharp on the mouthfeel, with an aggressive-warm finish. It has a medium finish and an astringent, bitter-seedy and rough aftertaste. This is definitely a good Wine of Moldova and the overall rating says the same, with 88.9 points scored it is right there, among the best wines we’ve tasted so far. Please click on the chart icon on the left in order to get to the wine rating page, where you can find all the wines we’ve tasted to date. Conclusion: this is a quite youthful wine that has yet to reach the summit of its prime form – expressive, fresh yet austere and definitely off balance. It feels too sharp and too rough at this moment in time, therefore we would strongly recommend a bit more bottle ageing (6 to 9 months will suffice), so that it will round up a bit and will turn all this angularity into some kind of elegance. We would recommend to pair this wine with dishes that are rich in creamy textures, like for example pasta alfredo or a quattro formaggi pizza, as the spiciness of the dish will cut nicely through all the roughness in the wine, thus leading to a very harmonious wine and food pairing. Cheers!